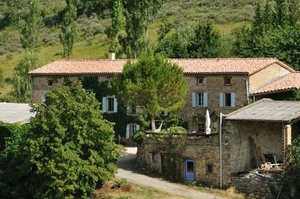 Ideally situated, 15kms/9 miles from Mirepoix, 21 kms/13 miles from Limoux, and 45 kms/28 miles from Carcassonne, right in the heart of Cathare country, and 1400 feet above sea level, Piquotalen, with its 1500 square metres/1800 square yards of meadows and woods, offers the ideal holiday destination for those wishing to escape the hurly burly and stress of everyday life in order to find peace, calm and the opportunity to relax. The farmhouse currently boasts 3 bedrooms (The Cathare, the Vigneronne and the Pyrenees) each with an en suite shower room. There is also a patio which catches the sun and we and our friendly animals (4 horses and 3 donkeys) as well as wild boar, deer and badgers, will do our best to make you feel at home. Piquotalen offers a warm welcome to individuals, families and groups throughout the year and is also suitable for seminars and other activities. More than 3 nights : 55 euros per night. More than 3 nights : 50 euros per night. More than 3 nights : 10 euros per person per night. Aperitif – starter or soup – main course – dessert – wine – water – coffee or tea. The Medieval City of Carcassonne or that of Mirepoix - Castles Cathar of Perpertuse, Quéribus..
By train : To Carcassonne and then by either train or bus to Limoux. Carcassonne (only 45 minutes away). Car hire available at airport. Toulouse (1 hour away). Car hire available at airport. Perpignan (2 hours away). Car hire available at airport. Montpellier (2 hours away). Car hire available at airport. For a small sum we can also pick you up from either the airport or the station in Carcassonne. Peyrefitte du Razes is on the D626 between Mirepoix (15 kms/9 miles) and Limoux (21 kms/13 miles). From Carcassonne, take the D118 as far as Limoux, then the D620 towards La Digne d’Aval and finally the D626 towards Mirepoix. From Toulouse, take the E80 (also known as the A61) towards Carcassonne, then the A66 towards Foix, exit at Pamiers Sud, take the D119 to Mirepoix and finally the D626 towards Limoux.